Uche Ikpeazu, who has yet to break into the Watford first team, has had three loan spells with Port Vale's local rivals Crewe. 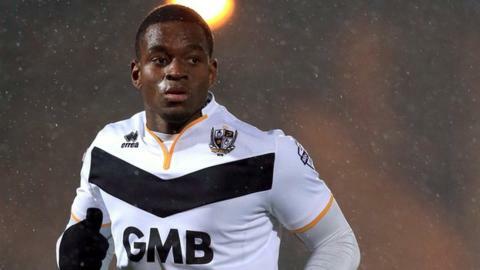 Port Vale boss Rob Page says Uche Ikpeazu needs to become more consistent after the striker returned to parent club Watford, following the end of his loan spell at Vale Park. Despite being Vale's joint-top scorer with six goals, Ikpeazu, 20, last found the net on 3 October and made the last of his 28 appearances on Boxing Day. "Sometimes with Uche, it's a little bit unpredictable," said Page. "We thank him for his goals but we feel we can improve on that now." Ikpeazu's last start for Vale was in their 2-0 defeat at Burton - a match in which he was sent off for two bookable offences - and Page admits the forward was unlucky to find his route back into the side blocked by in-form fellow striker AJ Leitch-Smith. "Uche started really well, dipped away a little bit, got sent off, and AJ came in and that's the nature of the game - you've got to be patient," Page told BBC Radio Stoke. "It's frustrating for him because he's maybe got pressure from Watford to be playing, from himself and his agent as he's out of contract at the end of the season and needs to put himself in the shop window - but I've got to be true to the lads who are playing well." Page says he hopes Ikpeazu can take some lessons out of his six-month stay with Vale. "I think his better games were at home with 4,500 cheering his name but away from home, not so much of an impact and I've had a chat with him about that. "That's something for his development and for him to learn from."